If you are only interested in USB recharging and not the battery pack function, then check out our page devoted to the Best USB Rechargers. If you travel a lot, you’ve probably been stuck on a long-haul flight, train, taxi – and had your iPad/iPhone/Tablet/Kindle/Blackberry die just when you need it most. It’s prudent, therefore, to take an external battery pack along with you to recharge all of your USB devices. Every manufacturer says something different about how much charge their product provides, which is confusing. Battery Packs appear to have a great deal of variation in their build-quality. Some people experience products that are DOA or become faulty after several weeks of use. You are advised to purchase yours from a reputable dealer who will replace it if it’s faulty, or a manufacturer who offers a decent warranty to cover at least 6 months. Furthermore, you are advised to keep your battery pack fully charged when not in use. If you leave your uncharged for weeks at a time, you will decrease its lifespan. Here are the USB battery rechargers we found with the highest mAh rating, which means the size of their internal power and how much power storage they offer. The iMuto 30,000 mAh Portable Charger takes top place. It has a 30,000 mAh battery, weighs under a pound and comes with 3 USB charging ports that are separately rated at 3.1A, 2.1A, and 1A. It has an LCD indicator to show you how much battery is left and a micro-USB 2.1A input for rapid charging of the device, itself. The RAVPower Xtreme 26800mAh Portable Charger comes a close second. It has just a little less juice – 26,800 mAh – but similar specs in other respects: weighs less than a pound and comes with 3 separately rated USB output ports – 2.4A, 2.1A, and 1A – plus a 2A input USB port. It doesnt have an LCD display, though, like the Gatcepot. It comes with a couple of micro-USB cables for you to use to charge devices or to recharge the power pack. It does not come with a power brick or wall socket recharger, so you will need to supply your own. That said, it has a 2A input, so it can recharge itself much faster than units with only a 1A input. NOTE: if you want your rechargeable power brick to be able to recharge your laptop, as well as your other devices, then the RAVPower Xtreme 23000mAh model can do that. 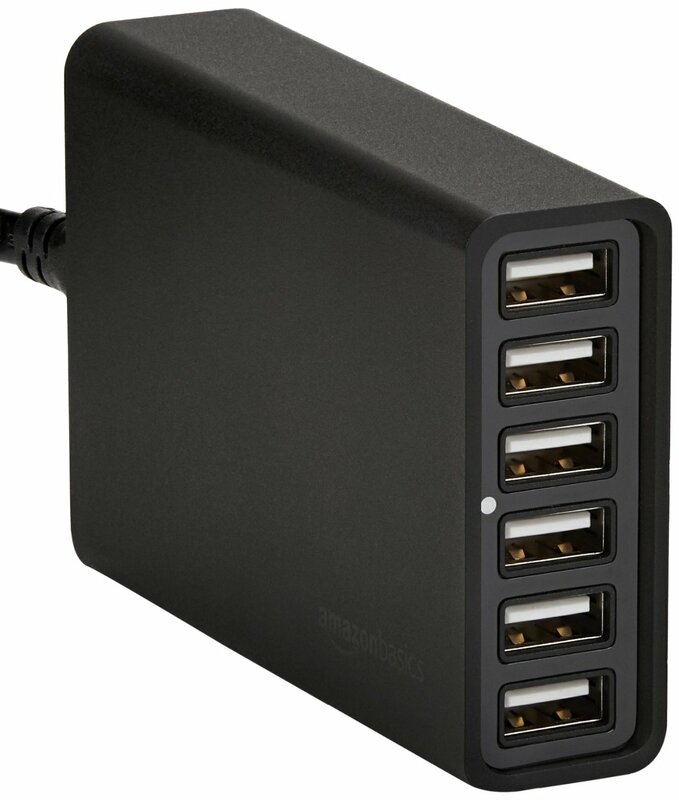 In addition to its two USB outputs (sharing 3.5A across them), it has an additional multi-voltage DC output port (9V/12V/16V/19V/20V) at 4.5A that can be connected to a wide variety of devices, including laptops. It comes with a selection of tips to accommodate whatever you may come across. The only laptop it cannot accommodate with its set of tips are the MacBooks that use magsafe connectors. However, there is an adapter you can buy separately to recharge your magsafe MacBook with it. The Anker Powercore 20100 Portable Battery Charger is our first runner-up. It doesn’t pack as much power as the Gatcepot- 20,000 mAh compared to 30,000 mAh (it’s name is misleading; perhaps, intentionally?). It only has 2 USB ports (compared to 3), but is slightly lighter at 3/4 of a pound and comes from Anker, which is a very reputable manufacturer of USB recharges and power products. The device could take several hours to recharge itself to full capacity. Some users have experienced slower recharging rates when using this product with the latest iPads, although this might have something to do with the cables they were using. We are including the Amazon Basics Portable Power Bank with an honourable mention, because it offers decent battery power (16,100 mAh) in a decent form factor at a reasonable price. While it may not have all the bells and whistles of the other two, you might find it to be a good overall compromise. Finally, we’re including the VIVIS 20,000 Powerbank Portable Charger, because it takes a unique approach. In addition to its 20,000 mAh battery and two outputs rated at 2.5A each, it also has two 2A inputs. This allows you to rapidly recharge the device via two USB cables at once in order to cut recharge time in half (they claim within 6 hours). If you like to travel light, go car-to-curb, or jet about to boutique destinations, you are more interested in the smallest, most ultraportable battery packs on the planet. The GMYLE(R) USB External Battery Ultra-Slim 2500mAh Power Bank is the size of a credit card, weighs 66 grams, and is a 2,500 mAh rechargeable battery. It has a micro-USB port on the side to recharge itself (you must have your own wall adapter and cable to recharge it). Cleverly tucked into the side of the device is a retractable charging cable. The cable has a micro-USB plug on the end. Also, there is a micro-USB to lightning plug dongle that slips onto the end, so you can use this device to recharge an iOS phone or table. Conveniently, this can remain stuck to the end and tucked neatly into the device along with the cable, so you won’t lose it. The charging ability is rated at 5V standard but only 1A, so it will trickle charge (not fast-charge) your devices. Second place goest to the Nunet Nucharger. It weighs nearly twice as much as the GMYLE (102 grams), but packs nearly twice as much power at 4,000 mAh. It’s comparable to carrying another iPhone 6 around with you. Like the comparable product, it comes with a retractable cable to recharge your devices with a micro-USB tip and, also, a lightning adapter dongle that can remain tucked away inside the device when not in use. Unlike the other product, however, this one does recharge at 5V 2A, so you will get fast-charging on some devices, which is a major plus. Third place goes to the TYLT ENERGI 6K+. It takes an unusual approach to great effect. It contains a 6,000 mAh battery inside a square plug with folding prongs, so you can plug it directly into the wall without having to carry around a separate cable and wall adapter to recharge it. It is essentially a wall adapter and battery in one. Even better, it comes with a built in Lightning connector for iOS devices as well as a USB output port, allowing it to recharge two devices at once, although it shares 2.4A across both ports. There is also a model that contains a built-in micro-USB cable if Lightning isn’t your thing. The Zagg External Battery Pack is a similar concept, just without the cables. It contains a 6,0000 mAh battery, has foldable power prongs, weighs half a pound and has two USB outputs which share 2.1A. It just doesn’t have cables built-in like the TyIt. The TyIt ENERGI 5K battery pack doesn’t have the built-in wall adapter, like its sibling, but we’re including it as a runner-up, because it has pretty good specs. It’s a bit long and wide (like an iPhone 6) but thin. It has a 5,000 mAh battery with the added convenience of two built-in cables – a lightning cable and a micro-usb cable. An honourable mention goes to the Pearl Compact Mirror USB Battery Pack, because it’s a very clever dual-function device. As a compact mirror it has a two mirrors inside, one with no magnification and one that is 3x, plus an LED light to illuminate your face, while you’re using it. As a battery recharger, it conceals a 3,000 mAh rechargeable battery, USB port and micro-USB port within the device itself. There are also small LED indicators that show you how much battery charge is left. It may not pack a lot of juice but it’s just enough for an emergency and it’s more likely that you remembered to pack it, because it has a daily use. It comes in a variety of colours, including gold, silver, pink and red. An honourable mention goes to the Polanfo 20000mah Power Bank, because it offers 20,000 mAh of power in a very svelte form-factor. It weighs just over a pound (1.1 lb) and comes with a handy digital readout to show you just how much power is left. It has three 2A outputs, which is slightly misleading since the unit has a maximum output of 3A shared across all three. What this means is that you can use one port to fast-charge a device, but if you add more devices they will all drop down to a trickle-charge. The unit does not come with a wall adapter to recharge itself, so you will need to provide your own. Also, it recharges itself via a micro-USB port, so you will need your own cable, too. Globetrotters are the type of people who like to really go native by bushwhacking in the Andes, skiing off-piste, or embedding themselves in a foreign culture. Like Road Warriors, they need mission-critical gear, but they often don’t find themselves conveniently placed near creature comforts, such as an electrical outlet. Therefore, we’ve decided to focus on solar power battery rechargers for this category of user. Obviously, you might want to use these to recharge a phone, or a gps device, like a Garmin. Please note, we are not looking at solar panels that don’t include a built-in battery. 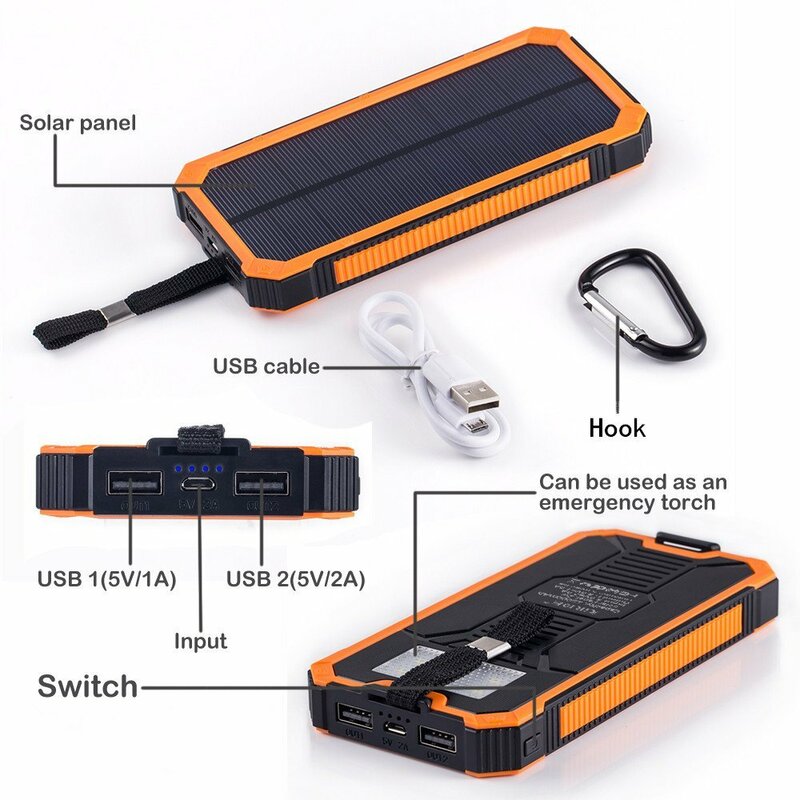 In keeping with this article, we are looking at portable battery pack rechargers that happen to have built-in solar panel(s), so they can recharge themselves when you’re in the middle of nowhere (so long as there is sunlight). The top slot goes to the SunJack 7W Solar Charger. It’s large fold-out panels can recharge its tethered 4,000mAh battery within 5 hours in direct (strong) sunlight. This makes it very practical to use in the field for days on end without having access to an electrical outlet. You can, of course, recharge the battery by plugging it into an electrical outlet (using your own power adapter and cable). The battery is not the largest on the market but it is the most practical in that you can truly recharge it within a day from available sunlight. It has two outputs – one rated at 1A and the other at 2A. The runner up is the GRDE Solar Charger. Given its 15,000mAh battery and smaller form factor, the solar panels are not going to be large enough to fully recharge the battery from the sun, unless you leave it outside for days. Instead, you should plan on recharging the unit from a power source before you set out and then ‘topping up’ the charge with sunlight. There are other similarly sized solar rechargers on the market that have larger battery capacities, but with batteries that big and solar panels that small the solar aspect becomes more of a gimmick than a feature. Suffice to say that the GRDE can respectably recharge itself in a couple of days of sun, if it has to. Most likely, you’ll be using it to extend its life when you go off the grid and will need to recharge it primarily from a car socket or electrical outlet. The GRDE comes with two USB outputs: one rated at 1A and the other at 2A. It recharges via micro-USB (you will need your own cable and wall adapter). It weighs around 10 ounces and has a carabiner, so you can clip it to your backpack, for example. It includes an LED flashlight, which is pretty standard these days for this type of product. The Nekteck Solar Charger is our honourable mention. It offers a 10,000 mAh battery in a similar form-factor to the GRDE. Also, it has a built-in flashlight. It has only one output but rated at 2A for fast-charging. One particularly nice feature is that the ports have a swivel cover, making this device more water-resistant. Also, users in the field report excellent solar recharge ability. For example, some are saying that it will recharge itself to 100% in the desert in less than an hour! According to the manufacturer, it is using a newer generation of solar cells, which may be responsible for this increase in performance.